10.Mastodon, Leviathan (2004):-In an age where metal has become ludicrously heavy and challenging (and Mastodon is right up there with the best of them), Leviathan presented a bold and colorful image that was also literary and had nothing to do with tired metal clichés. This was nice art, and smart art, and, as a bonus, the lush, fresh beauty of the cover concept continued right on through the booklet. 9.Tool, Lateralus (2001):-Tool has always excelled with their packaging, and Lateralus demonstrates what you can do with CD packaging if you apply some gray matter. The booklet is simply all plastic — essentially, those cool overlay sheets of the human body in the medical texts you used to play with in school. Add a bit of psychedelia and a mysterious plastic overwrap, and you've got the perfect Mensa-mad visual for Tool's geometric metal movements. 8.Dimmu Borgir, Spiritual Black Dimensions (1999) :-Most of the modern Dimmu covers could have made this list, but this one strikes a nice balance between the swanky and the evil, exuding upscale black metal as well as a modern use of color and precision. Black metal's early covers were as crude as the recording values within, so to represent that genre, one arguably had to lean toward the classier bands working fully in the digital-art age. Cradle's covers are also quite fetching, and of course, both these bands are looked upon as far from kvlt. 7.Slayer, Reign in Blood (1986):-Signaling a sea change away from clichéd, air-brushed illustration, Reign in Blood used a chaotic cutout technique with rich, dark colors. The class and gravitas of the painting foretold the weight the record would carry, and many now call it the greatest thrash album of all time. Oddly, it didn't exactly match the music enclosed, being doomier and more claustrophobic than the freeing speed within. Call it an adjunct, an extra piece of art to a 28-minute-long record that needed it. 6.Poison, Look What the Cat Dragged In (1986) :-This is one of those "best of the worst" arguments. But it's here because Poison concocted the most shamelessly glam look out of anybody, then laughed all the way to the bank — a case of extreme going mainstream. Look What the Cat Dragged In has the band looking like hot chicks, and ushers in the big hair and spandex that only Kurt Cobain could crush years later. None of the manly bits of metal enter this four-square picture, leaving only the incongruous name of the band to dish belligerence. OK, OK — this entry is what they call a little light relief. 5.Judas Priest, Screaming for Vengeance (1982):-This was Priest's biggest album, but the shocking yellow commerciality of the cover art was a strong image that helped push the band to new heights on the backs of "You've Got Another Thing Comin'" and "Electric Eye." The cover, with its pleasingly sculpted bird, would spawn two more similar graphics, Defenders of the Faith and Turbo, completing a triptych of memorable and pliable shirt-ready images. 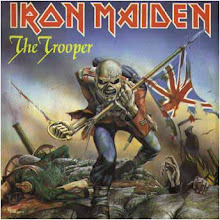 4.Iron Maiden, Killers (1981):-Eddie is the ultimate metal mascot, and Killers is his finest hour. Derek Riggs was astonishingly versatile with his colors over the years, but Killers makes lurid use of his trademark blacks and yellows, colors gleaned from the damp and mysterious streets around London in which he lurked at night, due to his insomnia. 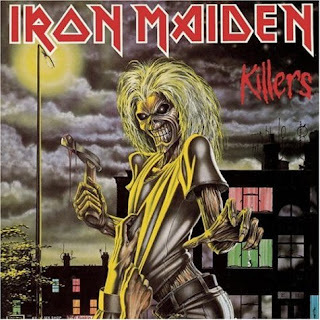 On the debut, Eddie was a bit stunned, but on Killers, he's a metal maniac out for vengeance. 3. Motorhead, Overkill (1979):-This had been the heaviest record ever to date, so right off the bat, the cover carried that significance. But Joe Petagno rose to the challenge, turning in the iconic version of the band's death mask, which to this day represents the band almost as much as Lemmy does. The colors were bright, the piece had motion and the expert use of text added to the unifying (and very heavy metal) feel of the whole. 2.Kiss, Alive! (1975):-Yeah, yeah, yeah: The Beatles and Elvis inspired guys to pick up guitars, but Kiss — and Kiss in the very act depicted on this front cover — were the ones to perform that function for the loads and loads of metalheads that ruled the '80s. Alive! showed Kiss trouncing Alice Cooper but good, and beyond the Oakland Raiders-on-acid look of it all, this was also a nicely composed and arranged picture. Alive! demonstrated the potential of metal graphically: simple, but with carnality. 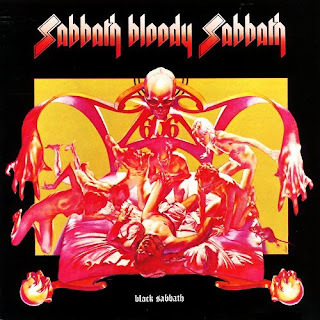 1.Black Sabbath, Sabbath Bloddy Sabbath (1973) :-Sabbath's debut was quite an important original metal piece, but Sabbath Bloody Sabbath blew the doors off any sense of subtlety, with the band capitalizing on the satanic hysteria of the day already fanned by the arrival of The Exorcist and the exit of the Age of Aquarius. Full-on evil on the front, eerily serene on the back, this one's been the subject of involved conjecture since the day it arrived.